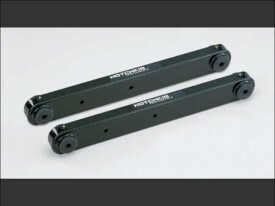 Hotchkis Performance lower trailing arms improve traction, reduce wheel hop, and improve handling and stability. Designed as direct replacements for weak stock trailing arms, Hotchkis trailing arms feature Tig welded construction from one piece of parent material, quiet operating greasable polyurethane bushings, sway bar mounts and a powder coated finish. Black Powder coat.